Once Upon a Time in Mexico is one of those very odd movies that I love for a ton of reasons, most of which really have nothing to do with the movie itself. It took me forever to actually sit down and watch this third entry (actually the forth if you count the fact that the third will probably never be filmed) in the Mariachi trilogy after missing it’s initial run in theaters. It had been on the Netflix queue for ages and I’d heard nothing good about it from friends so it actually ended up arriving by accident when I forgot to rearrange the order of the waiting movies. I’m a pretty big fan of Rodriguez, and the Mariachi flicks in particular because these were some of the first flicks that I watched in high school that opened the door to new and interesting movies I’d never considered watching before. The first two flicks, El Mariachi and Desperado, were also some of the first DVDs I’d ever purchased, not to mention some of my first experiences with DVD special features. After listening to the commentaries on both flicks I was forever spoiled by Rodriguez’s amazing talent for swift, insightful, entertaining and just plain awesome commentary and have since never quite found anything that lives up to it. El Mariachi is one of those movies that I didn’t realize how much I loved it until it was over. At first it seemed like a very straight forward foreign action film with so-so cinematography and quality and a bunch of novice actors, but as the film progresses and you get used to the comedy and shooting style you begin to see a glimmer of something more interesting on the screen. By the end of the third act when the Mariachi is in pseudo Mad Max mode, after he’s lost the girl he loves, and is going back out into the world much like Joe in a Fistful of Dollars it’s hard not to just smile at what Rodriguez was trying to do. Then once you get into the story behind the filming of the movie, it’s impossible not to love the movie. Filmed for $7,000 that Rodriguez earned while subjecting himself to a sequestered medical testing facility, the film is a marvel of frugality. Practically everything in the film was either free, borrowed or improvised, from the weapons (which were on loan from a Mexican police station) and locations, to the camera and the actors (who were either friends, local newsmen, or other "patients" from the testing facility), and most of the budget was used for film stock and developing. Rodriguez, knowing he was going to be spending a bit of time in the testing facility, made sure to use that time to write the script. The whole story is available in an awesome book he wrote called Rebel Without a Crew, which is pretty much a day by day journal of the time spent filming and then eventually shopping the picture around. Getting back to Once Upon a Time in Mexico, the first time I finally sat down and watched it I wasn’t sure what to think. On the one hand, it was visually interesting, one of the prettiest films I’ve seen shot on an HD digital camera, and the acting and character work was awesome (with a particularly great performance from Johnny Depp as Agent Sands, the Pureco Pibil loving, double crossing, crazed CIA agent.) Hell, I even enjoyed Enrique Iglesias. 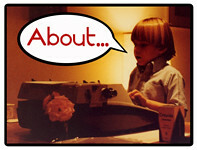 The story on the other hand was so convoluted and confusing that I was lost through most of the film. It doesn’t help that the film is not a direct sequel to Desperado, instead it’s the story that takes place after what would be sequel, and only makes a few flashbacks to the un-filmed third installment. Add to this the fact that the Mariachi, once again portrayed by Antonio Banderas (who replaced Carlos Gallardo from El Mariachi), isn’t the main character. Instead the movie is really more about Depp’s Agent Sands, though there are actually more like two or three different narratives going on all at once. It’s just really confusing as all hell. It’s actually similar to the differences between the first and second films, much like the first two Evil Dead flicks. 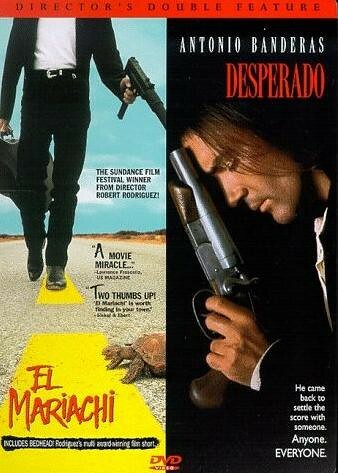 Desperado is more or less a remake of El Mariachi, though it really isn’t. This is also inspired by the Sergio Leone "man with no name" trilogy in that there are slight differences that don’t quite add up between the films even though they are about the same characters. It wasn’t until I listened to the commentary and watched the special features that I truly got a feel for how awesome an achievement this movie really is. Much like El Mariachi this film was shot under insane circumstances, done entirely in something like a month with a paltry 45 page script. Add to this the fact that for the first two weeks of filming, since the gun intended for use during filming were delayed at the border, the actors had to use rubber prop guns, which were digitally altered in post production to make them look as if they were firing. There were also scheduling conflicts that forced Rodriguez to film actors separately and then he cut the scenes together to make it appear as if both were on screen together. His use of CGI was also particularly inspired as well, servicing as bullet hits, squib effects, and in otherwise small places where it’s almost unnoticeable. The film was also shot right before a proposed actor strike, done so quickly that it was written, shot, and cut before the strike deadline. As an example, he had Johnny Depp for only 9 days on the the set and he’s in the majority of the film. When you consider all that went into this film, it’s actually a wonder that it came out as well as it did. Add to this the very first 10-Minute Cooking School special feature in which Rodriguez teaches the viewers to make Agent Sands favorite Mexican meal Pureco Pibil. I’ve made it based on Rodriguez’s instructions a number of times and it’s now once of my favorite dishes, both to prepare and eat. So it’s very hard for me to not love this movie, and in turn this DVD, as well as the sweet double sided combo disc that contains the first two flicks. This is a trilogy that I can really get behind. Now if Rodriguez would only find the time to make the missing third movie I’d be in heaven. Wax Paper Pop Art, Tron edition!